Small (11-12) - $46.99 Only 4 left! Medium (13-1) - $46.99 Only 5 left! Large (2-3) - $46.99 Only 2 left! X-Large (4-5) - $46.99 Only 1 left! You know the old song about a pair of boots that are made for walking? When you think about it, isn’t that a little bit redundant? After all, a pair of boots that isn’t made with at least the possibility of walking in mind is probably not a very good pair of boots. We’re not saying that every boot has to feel like sinking your feet into a fluffy cloud, but we would expect that walking is pretty close to the minimum requirement one should be able to expect from boots. On the other hand (or foot), boots by no means have to be made only for walking. 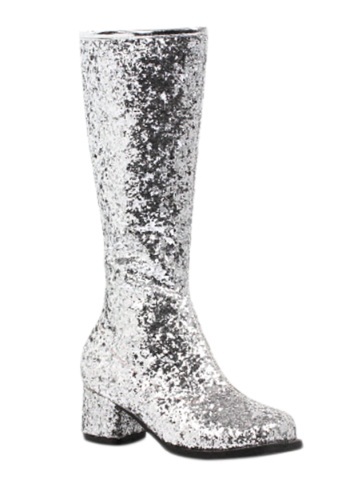 Take a look at these flashy glitter boots, for instance. These boots are made for dancing, if they’re paired with a go-go or disco outfit. Or perhaps these boots are made for elegant stepping, as part of a queen or princess ensemble. Or maybe these boots are made for clomping around as a robot or space invader. Made from synthetic materials, covered in sparkly silver glitter and featuring a 1.5-inch heel with an inner side zipper, these boots are made for whatever you want them to be made for. Your imagination is the only limit.